Most great recipes are born out of necessity. For example, sometimes your boyfriend wants cheesecake and yet, somehow, you don’t own a springform pan (wtf). So you make bars, obviously. Nearly any dessert can be made into a bar. I’m pretty sure that ‘the bar’ is gods very own gift to us. Aside from alcohol and illicit drugs. 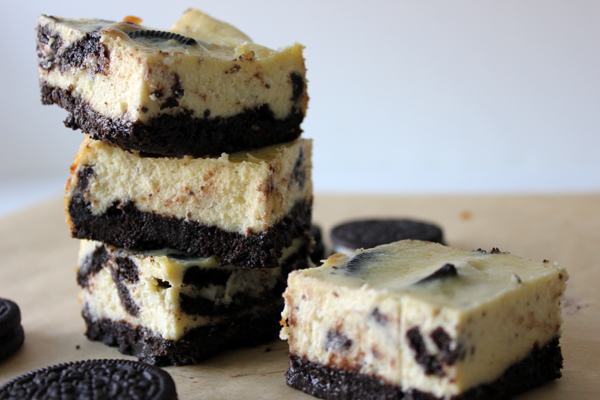 Enter the oreo cheesecake bar. Now, if you’re like me a lot of great oreos lost their life during the making of this blog post, but that’s okay. They were so brave, and very tasty. I think it pretty much goes without saying that these are good. Really good. Minus all the freaking oreos I ate at 10am on a Sunday. That was bad, all bad. Don’t get me wrong, they were delicious but the headache? Awful. So if you have some time, I suggest you make these and everyone will be happy. Step 1: preheat oven to 325º. line an 8×8 baking dish with parchment or tinfoil. if this sticks, it will end your life. Step 2: make the crust. Put cookies in food process and process well, until they’re all crumby, yo. Add melted butter and pulse until combined. add crust to pan and make sure it’s evenly distributed and packed in tightly. bake for 10 minutes. Step 3: make the cheesecake. cream the cream cheese in a mixer for, eh…3 minutes until it’s not lumpy. slowly add sugar and make sure its combined well. add eggs one at a time until mixed. throw in the sour cream and vanilla and mix to combine. Step 4: coarsely chop cookies. i cut mine into quarters, which is obviously the proper way to do this, but it’s your funeral. fold into batter. Step 5: pour batter onto cooled crust and bake 45-50 minutes. you want it to be set with a little jiggle. Step 6: let cool on a cooling rack, duh, for about an hour or however long it takes it to get it to room temp. this will vary depending on the temperature of your kitchen. Step 7: once cooled, throw that pan into the fridge for a few hours because who wants to eat warm cheesecake? no one. Nom nom nom gimme one plz. Glad you’re back! Also, nomnomnom. oh my god. why are these not in front of me right now?! they look so good!! omg, yum!!! I had a reese’s brownie similar to this yesterday. So delish! Oh, those are so beautifully wrong…no, they’re right, it’s just wrong that I want one RIGHT NOW and it’s 5am Hawaii time. This sounds right up my alley–I love oreos! You’re back! Keep the posts coming please! They look so dangerously good! wow. these look insanely delicious. thanks for sharing! First the ice cream, now the oreo cheescake bars?! You are killing me! I need to make these! NEED.